Chinas gloomy economic outlook has delayed plans to build more Jettas. BEIJING -- Due to worsening economic conditions, FAW-Volkswagen Automotive has postponed a plan to build a new 350,000-unit assembly plant in Chengdu, China. The companys existing Chengdu plant has a capacity to build about 20,000 units of the Jetta. FAW-Volkswagen has been seeking approval from the Chinese government to build the new 1 billion plant, according to Chinas Ministry of Environmental Protection. However, capacity at the Chengdu plant will not be increased before 2011, Winfried Vahland, CEO of Volkswagen Group China, said in an interview with Automotive News China. FAW-Volkswagen planned to put its new Chengdu plant into production in 2010, with an initial capacity of 200,000 for both the Jetta and Sagitar cars, said a supplier executive. The automaker has postponed its original plan, due to the gloomy economic outlook in China, he added. Vahland said there is no plan to build a second model in Chengdu. 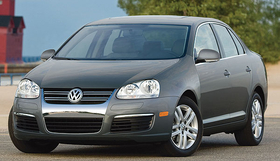 FAW-Volkswagen assembled about 14,000 units of the Jetta in Chengdu in 2008. It plans to build 18,000 Jetta cars there in 2009, according to a manager at the Chengdu plant. FAW-Volkswagen has been making the Jetta in Chengdu since 2007.